Verona Boys Varsity Lacrosse captures it fourth WLF State Championship, Saturday June 14th at Perkins Field on the campus of UW-Whitewater. On a beautiful summer evening as the sun set on a day filled with anticipation, the Verona Boys Varsity Lacrosse team took the field to prepare for the WLF Wisconsin Boys Division 1 Lacrosse championship game. Their opponent was the Waunakee Warriors, a formidable conference foe that Verona faced and fell short to twice during conference play this season. With the challenge set, play began to determine the 2014 State Boys champion. Waunakee opened scoring, taking a early 1-0 lead during their first offensive possession. A couple of minutes later Joshua Novotny started the night for Verona with a dodge and shot that tied the game. The remainder of the first quarter saw play go back and forth, with defensive stops on both ends of the field. Senior Sam Becker had several key stops before Trey Kazda found the net with a dodge from behind the net to give the Wildcats their first lead of the night. The first quarter ended with the Wildcats in the lead 2-1. The second quarter saw more defensive stops on both ends of the field until Conner Novotny took a ground ball the length of the field and found Trey Kazda behind the net who quickly hit Senior Alex Kramer for a strike that put Verona up by 2. After several good chances the half ended with Verona leading 3-1. The third quarter saw Waunakee battle back, scoring at 8:56 of the quarter to narrow the margin to one. As play resumed Verona won the faceoff and Joshua Novotny found Jack Cioci with time and space to answer the call and make the score 4-2. As the quarter continued, Waunakee was not going to be denied as they scored two goals to level the score to 4-4 at the end of three quarters. With the score even going into the fourth quarter, Waunakee struck first taking over the lead they lost in the first quarter at the 10:12 mark. Less than 30 seconds later Verona answered when Jake Taylor found a seem above goal line extended and scored. Waunakee scored to retake the lead at the 7:10 mark of the fourth and time was running out for Verona. The defense for Verona stood strong time and time again behind solid play from sophmores David Romens and Shane Herkert and senior Shahan Zaman. As the clock clicked down to the 1 minute mark, Kenny Keyes ran past a brilliant screen set by Zach Nechvatal and ripped a shot into the low corner past the Waunakee goalie to tie the game at 6-6. Waunakee had several opportunities late but a key take away by Luke Thomson sealed the result of regulation play which ended with the score tied. So the game entered overtime with the next goal being the deciding factor in who would become the state champion. Waunakee controlled the possession time for the first two minutes of the extra period and after time outs by both teams play continued. Verona was able to create an opportunity after a take away and fast break, Jack Cioci ripped a shot that hit the crossbar, flying high into the night sky under the lights of the stadium. Waunakee recovered and cleared the ball to their offensive end and after a huge defensive stop and collecting a ground ball Verona moved the ball quickly to the other end where Jack Cioci ended the game with a bounce shot that passed by the Waunakee goalie and found the top of the net, ending the game. The Verona Wildcat Boys Varsity team earned its fourth state title in exciting fashion with a 7-6 overtime win. The win follows a season where the team showed promise and had success before facing adversity along the way, only to bounce back and show that teamwork and resilience are the tools needed to become a champion. Congratulations to the Varsity Boys on a fantastic season and the title of state champion for the 2014 season. Verona finishes the season with a record of 17-4 and a championship title as the winner of the Bullrush tournament in May. Verona graduates 12 seniors; Jack Cioci, Conner Novotny, Kenny Keyes, Zach Nechvatal, Shahan Zaman, Alex Kramer, Daniel Adler, Sam Becker, Nathan Procell, Jackson Hopfensperger, Konnor Heyde, and Jake McCulloch. Good luck to all of our senior champions, we will miss you! Senior attacker Jack Cioci was dealing with injuries the past few seasons, but he was healthy this year. And it was a good thing for the Verona Area High School boys lacrosse team, as Cioci was the one who grabbed the puck early in overtime of the state championship game last Saturday at Perkins Stadium at the University of Wisconsin - Whitewater. Cioci not only got a shot off, but he was able to bury the game-winner as the Wildcats defeated Waunakee 7-6 to claim the Division 1 title. Waunakee took a 6-5 lead with seven minutes to play when Mitch Cords scored with an assist to Payton Smith, but senior Kenny Keyes was able to keep the Verona season alive with an unassisted equalizer with just over a minute left in regulation. Verona jumped out to a 3-1 lead earlier with goals by sophomore Josh Novotny, junior Trey Kazda and senior Alex Kramer. Kazda had an assist on the Kramer goal. Brett Templin cut Verona’s lead with a goal at the start of the third quarter, but Cioci scored with an assist to Josh Novotny to make it 4-2. Waunakee came right back with three goals, two by Mark Herzberg, and another by Templin, and then junior Jake Taylor scored to knot the game at 5-5. “Waunakee is a team we played before and we knew we could match their talent,” Cioci said. Senior Sam Becker finished with 12 saves for Verona, while Kyle Katterman collected 10 for Waunakee. The Wildcats had their banquet on Monday, but Cioci said the thought of being a state champion hasn’t completely set in yet. “We haven’t watched the game film yet, and I think that is when it will sink in. But right now, it is still kind of surreal,” Cioci said. Verona was able to get revenge on the team that defeated them at state last season on June 11 with a 13-12 win over Marquette University High School. Cioci scored four goals, while Kazda and Keyes added three and two goals, respectively. Senior Zach Nechvatal, sophomore Dominic Sabbarese and Kramer all added a goal. Senior Connor Novotny and Kramer also collected three assists each. Becker finished with 22 saves. Jack Cioci scored the game-winning goal in overtime to give Verona a 7-6 victory over Waunakee in the Wisconsin Lacrosse Federation Division 1 boys state championship game Saturday night at the University of Wisconsin-Whitewater. The teams were tied 6-6 at the end of regulation. Verona’s Kenny Keyes tied the game with 1:05 left in the fourth quarter. With 10:12 to play, Mark Herzberg scored to give Waunakee a 5-4 lead. But Verona’s Jake Taylor scored just 30 seconds later to tie it, and Mitch Cords added a goal with 7:10 to play to give Waunakee a 6-5 lead. Verona took a 2-1 lead after one quarter, and Alexander Kramer scored in the final minute of the first half to give the Wildcats a 3-1 lead at the break. Waunakee then outscored Verona 3-1 in the third quarter to tie the score, 4-4, entering the fourth quarter. • Division 2 boys: Waukesha Catholic Memorial took a 19-8 victory over top-seeded Stoughton in the championship match. • Girls: Undefeated Hartland Arrowhead beat Verona, 5-4, in the championship match. The Verona Area High School boys lacrosse team surprised a few teams last year to make the state championship. That surprise gives way to expectation this season as 17 returners look to make a similar run in 2014. “I think we know what we’re playing for, but we don’t really discuss championships and stuff like that; just taking things one day at a time,” head coach Michael Storts said. “The goal for this team is to grow into empathetic, high-character people and strive for the gold standard of lacrosse – playing with teamwork, control and technique. Some of the key returners listed by Storts are seniors Alex Kramer (attack), Jack Cioci (attack), Sam Becker (goalie), Shahan Zaman (defenseman), Kenny Keyes (midfielder), Connor Novotny (midfielder), Zach Nechvatal (midfielder) and Konnor Heyde (attack). Juniors Trey Kazda (attack) and Jake Taylor (attack/midfielder) and sophomore Josh Novotny (midfielder) were also listed as key returners by Storts. Storts said Kramer is a “prolific, interior scorer” and a “future coach,” while Cioci returns from an ACL injury to add leadership and scoring skills, also named a “future coach” by Storts. Kazda and Taylor will also play the attacker position. Storts said Kazda can create chances for himself and others, while Taylor returns from an ACL injury with the ability to create and execute outside shots. Also on offense is Heyde, who will be a backup at the attack position. Becker is back as a 4-year starting goalie and was on the state championship team as a freshman. Storts said Becker is Verona’s best player. Lastly, Zaman comes back as a “college-ready defenseman.” Zaman is going to be paired up against the best attackers all season. A few newcomers expected to contribute right away are juniors Luke Thompson and Cameron Shoemaker, sophomores Dominic Sabbarese, Brycen Smith, Alex Jones, Shane Herkert and David Romens and freshman Jake Keyes. The Madison Area Lacrosse Association conference looks to be a tough race this year with Storts naming Waunakee as the team to beat. Waunakee lost in the semifinals to eventual state champion Marquette last year. Middleton, Sun Prairie, Madison Edgewood are expected to surprise, Storts said, while Janesville gets a new coach that was a Verona standout. Kevin Bice takes over for the program, and Storts said that his familiarity with Verona will make the season series a challenge. This wasn't the only championship this season, don't forget BullRush! The 14th Annual BullRush Jamboree lacrosse tournament was held May 17th and 18th at Verona High School. The state's original and longest running lacrosse tournament hosted 12 Varsity teams and 8 JV teams in seperate tournaments. In total there were over 500 lacrosse players visiting Verona for the event which showcased some of the best lacrosse teams in the state. The Verona Lacrosse Club would like to thank all of the teams that participated in the event! The high level of game play was only surpassed by the sportsmanship exhibited by the players on the field! The results are in. See the results links for the full details. Another memorable year for the Verona Lacrosse Club will come to an end on Saturday, with both the Boys and Girls Varsity teams advancing to the state finals. Both games on Wednesday night were thrilling, closely contested games with the Boys defeating top ranked Milwaukee Marquette 13-12 in the rain in Milwaukee and the Girls winning in overtime against Mukwonago 10-9 at Connor Field. ​For the Verona Boys, this marks the 7th time they have advanced the state championship match in the clubs history, having captured 3 titles along the way. The last title for the boys was in 2011 where the Wildcats defeated Marquette 9-8. In 2013 the Verona Marquette rivalry was replayed with Marquette coming out on top 11-8. In the matchup Saturday Verona will play Waunakee, a team they fell to twice during the regular season. Waunakee defeated Arrowhead 11-7 to punch their ticket to the game. Waunakee is riding a 12 game win streak after loosing to Arrowhead in early May. Verona is on a 4 game streak of its own after dropping a match with Waunakee in late May. The game promises to be a good contest between long time conference foes. The lady Wildcats are making their 4th trip to the state title game and are looking to capture their first state championship in the history of the program. They are facing a formidable Arrowhead Red squad that won convincingly 18-5 over Sun Prairie in the other state semi-final matchup played Wednesday evening. Arrowhead brings a 14 game unbeaten streak into the matchup while Verona has won 5 straight leading into the title game. The Wisconsin Lacrosse Federation is the US Lacrosse Chapter in the state and sponsors the State Championship tournament. The boys programs are divided into division 1 and 2 with Verona participating in Division 1 play. All teams with Varsity programs, either club or school sponsored, participate in the WLF State Championship tournament. This season 17 girls programs and 38 boys programs started the statewide playoff tournament on June 3rd and both Verona teams have survived to be playing in the last game of the season. The club congratulates Sue Romens and Mike Storts on their accomplishments as the head coaches of their respective programs. A special thanks goes out to the assistant coaches, team managers and parent managers who worked hard to make the season successful. Last but not least we congratulate the players who put in countless hours of practice time and play the games to earn this great honor of playing for a chance to make history. The continued success of Verona Lacrosse at the highest levels of state competition shows the quality and commitment to teaching the game from the earliest ages, and all of the committed staff and players who truly honor the game. We invite you to make the trip to UW Whitewater on Saturday and to sport your orange and black as our teams play. Watch the website for send off ceremonies at the teams depart on Saturday! GOOD LUCK AT THE STATE CHAMPIONSHIPS! GO WILDCATS! The success and hard hard work of our High School Varsity teams is paying off with statewide recognition again this season. The Wisconsin Lacrosse Federation holds State Championships every year which are statewide tournaments in both boys and girls lacrosse. Both the boys and girls teams have reached the state semi-final games and the field of teams is now narrowed from all teams in the state to just four teams remaining. The fifth ranked Varsity Boys team started playoffs with a bye and defeated Lakeshore at Connor Field last week 14-6, earning a quarterfinal matchup last Saturday with fourth ranked Bayport HS in Green Bay. The boys boarded the bus Saturday with expectations of a close match as the Bayport Pirates finished the regular season and first round of the playoffs undefeated. With .3 seconds remaining in the first half, the Wildcat boys tied the game at 3 and never looked back, outscoring Bayport 7-2 in the second half for a 10-5 victory. The Wildcat Boys will travel to top ranked Milwaukee Marquette on Wednesday to play the Hilltoppers in a rematch of last years state championship game where Marquette edged the Wildcats 11-8. Marquette advances to the semi-finals with victories over Wildcat conference foes Janesville and Westside. The winner on Wednesday will face the winner of a matchup between second ranked Arrowhead and third ranked Waunakee, also playing off Wednesday at Arrowhead HS. In girls action, the lady Wildcats are ranked second entering the tournament and have handled both Lakeshore and Brookfield in overwhelming fashion to earn a birth in the state semi-finals. The girls defeated Lakeshore 18-4 in a first round game to face Brookfield who they dispatched 12-7. They will play Wednesday night at Connor Field and will host third ranked Mukwonogo for the right to travel to Whitewater and play in the WLF State Championship game. 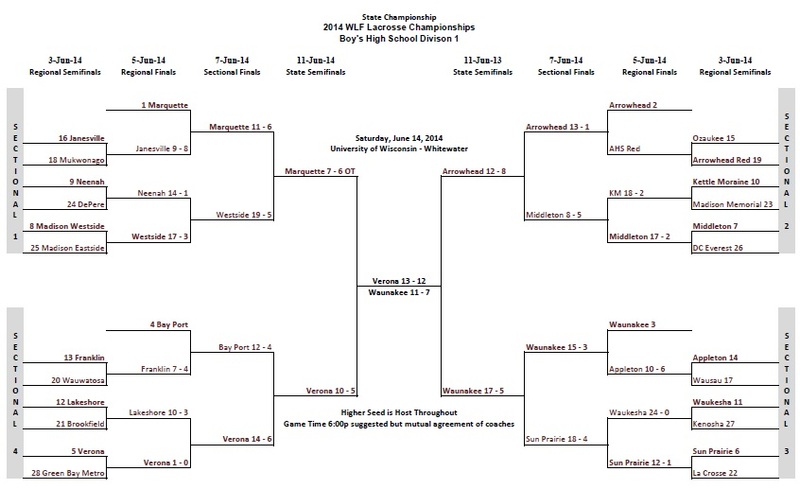 The other side of the bracket has first ranked Arrowhead Red facing fourth ranked Sun Prairie. The WLF State Championship games will held at UW-Whitewater at Perkins Stadium on Saturday June 14th. We hope to see the Wildcat teams making the trip to the championship again this season! GOOD LUCK WILDCATS! Please watch the site for game times and come out and support your Wildcats on Wednesday night!